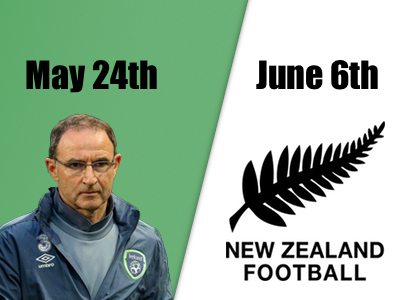 An Evening with Martin O’Neill next month and a friendly against the New Zealand All Whites in June are just two of the events which Cabinteely FC has organised to coincide with their Golden Jubilee celebrations. The South Dublin club, which caters for football for all from five to SSE Airtricity League of Ireland, kick starts their celebration with “An Evening with Martin O’Neill” in the Royal Marine Hotel, Dun Laoghaire on Wednesday 24th May at 8pm. Two weeks later on the 6th June, the action switches to the pitch at Stradbrook when the Pat Devlin’s side will host the New Zealand All Whites in an historic friendly with a 7pm Kick Off. The All Whites, the OFC Champions, have advanced to the closing stages of the Oceanic Qualifiers for the 2018 World Cup, and are managed by former West Ham and Luton player, Anthony Hudson. Included in the panel currently are Sam Brotherton (Sunderland), Winston Reid (West Ham), Chris Wood (Leeds Utd), Tommy Smith (Ipswich Town) as well as former Celtic and Motherwell player, Michael McGlinchey. The Cabinteely game is part of a three game preparation for World Cup Qualification. They face Northern Ireland on June 2nd and Belarus on June 12th. Tables of 10 are available for the Martin O’Neill event at €500 or individual places can be accommodated at €50 each. Tickets for the New Zealand friendly are available at €20 and €10 for Senior Citizens. Tickets are available online now. In announcing the two events Larry Bass, Chairman of Cabinteely FC, said, “These two events are being staged not only to celebrate our 50th anniversary but also as a recognition and an appreciation to those who have contributed so much to the club since its formation in 1967”. “We are a forward looking club catering for boys and girls, ladies and men, and special needs teams in a football–for-all ethos and the staging of these two international events demonstrates our ambitions for the future. Bringing Pat Devlin as our Director of football and now bringing International competition for fans in Dun Laoghaire is in keeping with the ambition of the club”. “I would like to thank Martin O’Neill and New Zealand Football for agreeing to participate in our celebrations and I extend my appreciation to the FAI for their full support and cooperation in the arrangements for the two events”, the Chairman concluded. Republic of Ireland Manager, Martin O’Neill, said he was looking forward to his event. “We have a very busy schedule of friendly matches and qualifiers over the next few months but I am looking forward to joining Cabinteely FC for their celebrations on 24th May and to meeting their fans and corporate supporters alike on the evening”. “Along with our friendly internationals against Northern Ireland and Belarus, this match is important for us in our preparation and conditioning for the FIFA Confederations Cup,” Hudson concluded. Pat Devlin, Director of Football and First Team Manager at Cabinteely FC said, “This is a great opportunity for this young Cabinteely team to face an international team which contains players who have experience in England, France, US as well as Australia and New Zealand itself”. “I am really pleased with their reaction and performances in the SSE Airtricity League of Ireland this season and I’m sure they will also acquit themselves well on June 6th, however I may look to strengthen the squad by including some guest players for the game”, Devlin concluded.